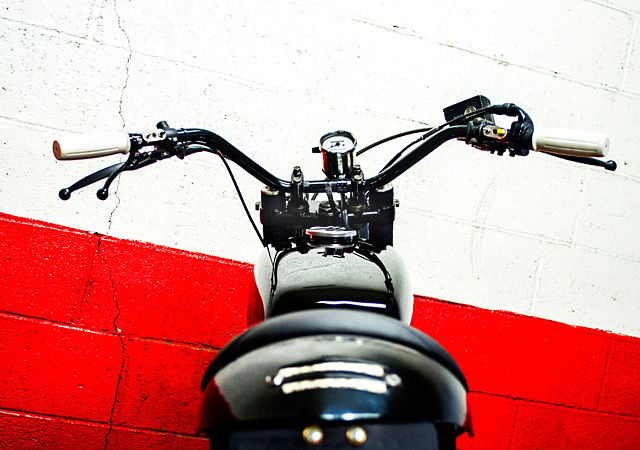 Struggling to find a donor motorcycle for your next build? Asking prices for ratty old SR400’s making your shake your head? 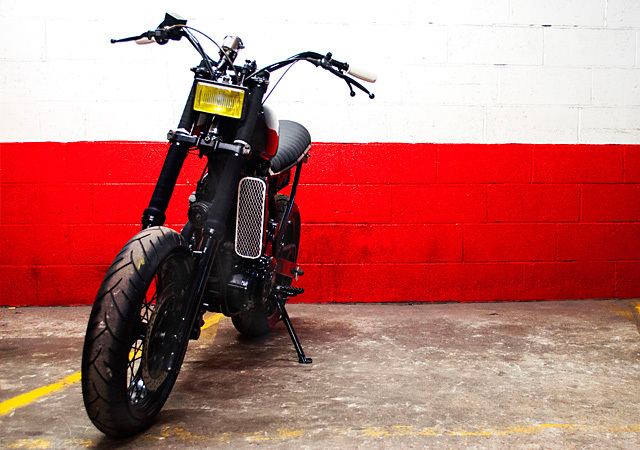 Refuse to spend all your time and money on a glorified old Honda commuter? Thankfully there are better starting points for your next project. Big bore trailbikes. They’re reliable, they’ve got a bit of poke and they’re still very affordable. 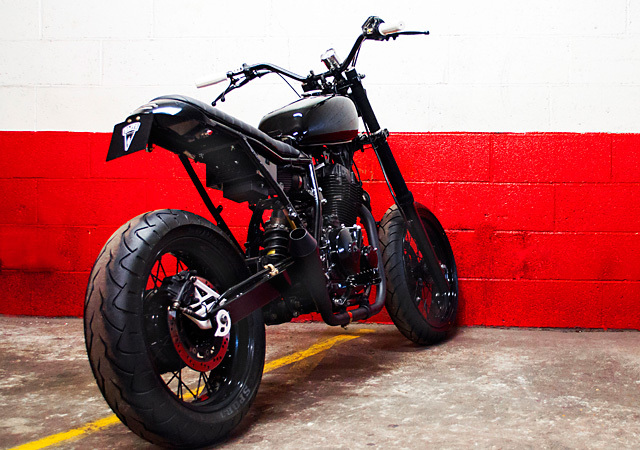 So here’s a guide on how to turn an old chook-chaser into a blacked-out side street carver like this 1994 DR650 ‘Arsenale’, put together by French company Blitz, makers of some of the nicest switchgear you’ll ever mash your thumbs against. Step 1. Ditch the old surf swirl graphics that keep the DR looking like it’s wearing an 80’s leisure suit. Gut the air box and break out the grinder, cutting off all unnecessary tabs and mounts hanging off the frame. And while you’re there cut down the rear subframe and weld in a loop, with dedicated holes to sneak in some LED brake and indicator lights. While the TIG welder is out and sparking make up a battery case under the seat to cradle a lithium-ion battery. Step 2. If you haven’t already, form a relationship with your local powdercoater. They’re an odd bunch no matter where in the world you are. Try taking them a small present like meat, alcohol or an unwanted child. 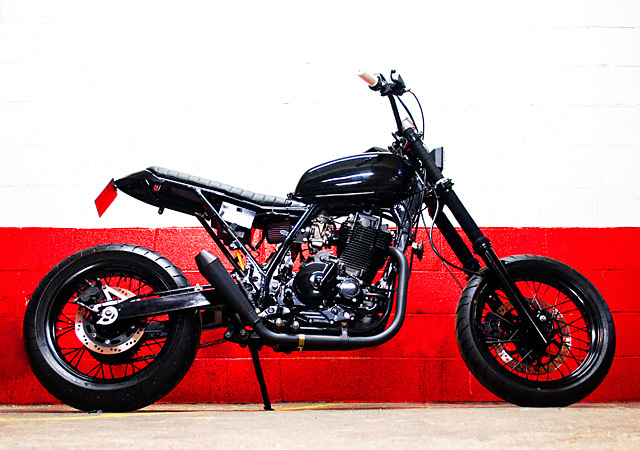 Then tear the rest of the bike apart and get everything blasted and powder coated gloss black. And I mean everything. The fork legs, engine covers, swing arm, side stand, hubs, foot pegs and triple clamps. Step 3. While everything is off getting electrified, sprayed and baked, turn your attention to the key part of a good DR tracker build. 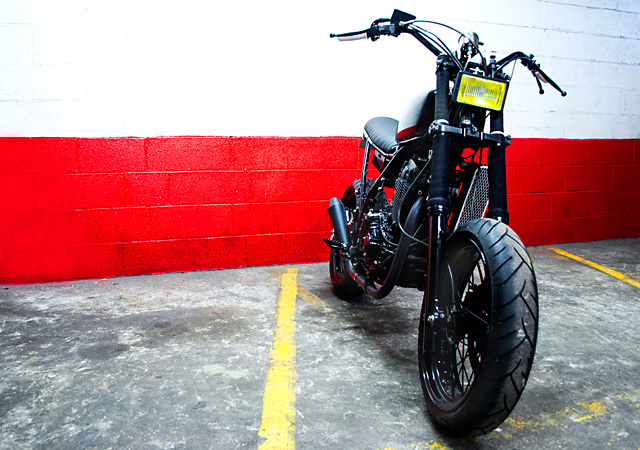 Replace the huge 21” front wheel that makes DR650 cornering so lazy for something smaller. On this bike, Blitz are running 17-inch wheels on the front and back. It’ll make it turn in quicker and will offer a much better selection of rubber. Step 4. Freshen up the engine. Cross yourself, look skywards and thank the flying spaghetti monster that you’ve decided to dedicate your attention to a single cylinder engine. One piston, one set of rings, some rockers and one bespoke stainless steel system is all it takes to get a DR drumming along nicely. At this stage, I’d recommend visiting a friend lavishing attention on an old Honda four watch them eat pot noodles for a month to afford the same set of parts. Step 5. By now you should have gotten everything back from the powdercoater. Bolt it all up and admire the progress you’ve made. 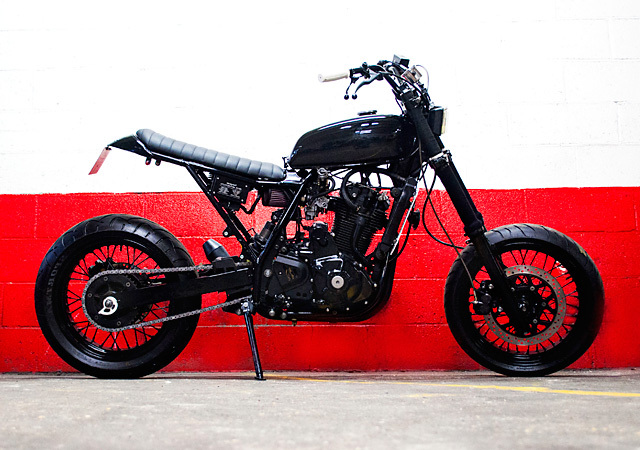 Swap the tank for something a little lighter, more beautiful and significantly less ‘dirtbikey’ than standard. 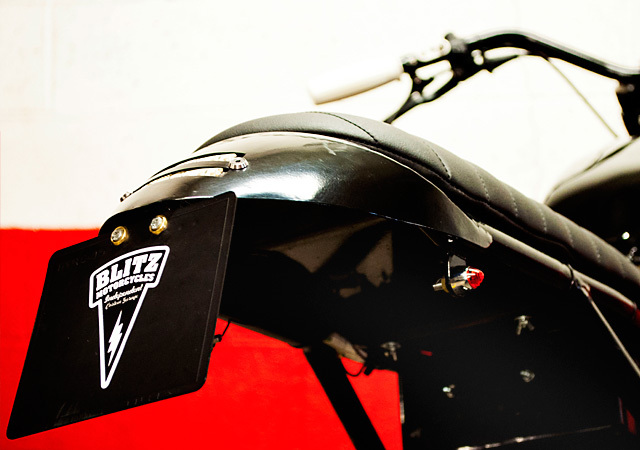 An old Suzuki GT125 tank worked just fine for the guys at Blitz. Step 6. Bolt everything back into the frame. Affix a small speedo keeping the front end looking nice and light. Find an old auxiliary headlight from a ‘70’s rally car to mount up and strip the loom back to its bare essentials. Install some lightweight, slim French-built controls from Blitz on a pair of old Triumph handlebars you have lying around. Step back and admire. Step 7. 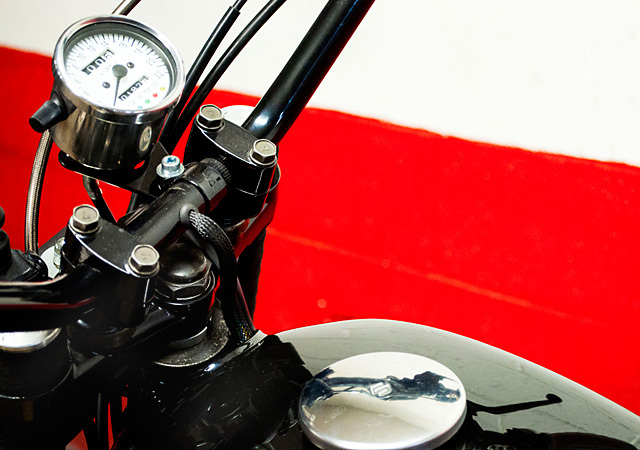 (Optional) Lend your newly created pride and joy to one of the world’s most famous motorcycle racers when he’s in town and looking for a set of wheels. Someone like, say, Roland Sands. Then, at 20km/h and in first gear, let the man crash it on some light gravel right before its first public debut at the screening of a motorcycle film. And there you have it. You’ve got an affordable head-turner that’s quick, exotic and still manages to bark into life every time you thumb the starter. And if you do piece together a bike as cool as Blitz’s ‘Arsenale’ and can’t track down a former US #1 plate holder to drop it, I know of a semi-employed motorcycle journalist who would be happy to help.